I recently posted a large article over at the MusicPLN.org (MPLN) about the state of the site. I am very excited to say that, by ALL accounts, the site has been a smashing success. Not only because of the number of Music Educators that have signed up for it, but because of the sustained conversations that are happening across it. It is now obvious to me and others using the MPLN that this this Social Network is not only filling an existing “hole” or “gap” in our current Music Education Community, it is spurring a type of electricity that is energizing our “base” and creating a lot of excitement. Quite frankly, this type of discussion is desperately needed among our practitioners -this and more. In a time when it seems like all of the “cards” are “stacked” against us in the public and private school systems, along comes the liberation that this kind of dialog and community provides and inspires hope. If you are a Music Educator and looking to start a conversation with your peers and experience Professional Development on a 24/7 basis, check out the MusicPLN.org -you might just find a home. 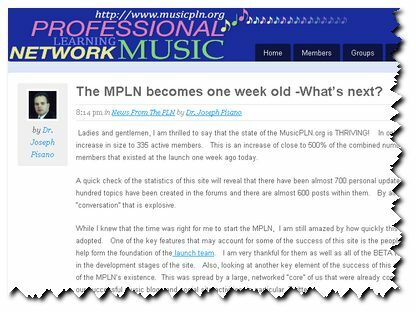 Ladies and gentlemen, I am thrilled to say that the state of the MusicPLN.org is THRIVING! In only one week we have managed to increase in size to 335 active members. This is an increase of close to 500% of the combined number of Alpha and Beta Team members that existed at the launch one week ago today. A quick check of the statistics of this site will reveal that there have been almost 700 personal updates made on our site, nearly one hundred topics have been created in the forums and there are almost 600 posts within them. By all accounts -this is a musical “conversation” that is explosive. While I knew that the time was right for me to start the MPLN, I am still amazed by how quickly this site is being found and adopted. One of the key features that may account for some of the success of this site is the people that were hand selected to help form the foundation of the launch team. I am very thankful for them as well as all of the BETA team members that helped early in the development stages of the site. Also, looking at another key element of the success of this site was the rapid awareness of the MPLN’s existence. This was spread by a large, networked “core” of us that were already connected online through our successful music blogs and social site activities, in particular, Twitter.